The loyalty of our faithful pets will be cherished in their memory on this memorial stepping stone, etched with a tender verse. It's ideal to place in a garden, on a walking path, at the foot of a tree, or anywhere memories have been shared. It is also a lovely plaque, with a built in hanger, and could be hung either inside or outside. Cast in resin to emulate the look of sandstone. Each piece is painted and include beads for added detail. 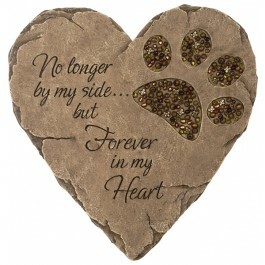 A large beaded paw print decorates the right side of this stone. A keyhole hanger is cast into the back for easy hanging. THANK you for the stone. It was reasonable, came on time, and was perfect for a dog.